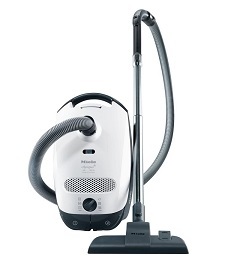 The Miele C1 series consists of their lightest weight canister vacuums, designed mostly for low pile carpets and rugs. They are very versatile and easy to move around, and can be equipped with a variety of attachments for most surfaces around your home. With a 30 foot cleaning range and their standard 1200 watt Vortex motor you can still handle larger sized rooms with relative ease. Another feature that you don’t normally find on models in this price range is quieter operation. Their “Silence System” consists of extra sound dampening insulation and a quieter operating motor, for lower noise than you might expect. While you might think of the bagged Olympus as more of a low-end or budget vacuum cleaner, that isn’t really an accurate description. Sure it is their cheapest canister but that is more of a result of what it was designed to do rather than cheaper construction. Since it is built more for hardwood, tile, laminate, and linoleum floors it doesn’t come with a heavy duty turbo brush like their larger cleaners. It works great on low pile carpets too since you don’t need a beater bar for agitating deeply embedded dirt. As mentioned above, the Miele C1 lineup is really focused on hard floors and low pile or thin carpets (including area rugs). When cleaning those types of surfaces you don’t need a fast spinning brushroll or beater bar to stir up the deeply embedded dust mites. Instead you can rely on powerful suction and a good design of the cleaning head to maximize the overall performance. The Olympus was also built to cover everything from floor to ceiling. With an overall weight of only 13 pounds it is easy to carry around the house, even up and down stairs. The wand can reach up to most ceilings, and the power can be turned way down when using on curtains or walls. It is ideal at most surfaces founds in the modern household. While this Miele canister vacuum cleaner is excellent for most floor types, it will struggle on high pile or thicker carpets. It does have the power for the job but lacks the weight and necessary attachment to succeed. For those types of carpeting you need to have a beater bar and spinning brushes as well as the weight to really push them down into the fibers. This is the best way to agitate deeply embedded dirt and allergens that are sure to be hiding there. This is the only area that the Olympus will struggle with but that is not surprising since it wasn’t designed for it. However, it is an important thing to mention as there are other canister vacuums in their lineup that are better suited for the job. The Miele C1 is one of the best choices for hard floors like tile and wood. It is very lightweight, has non scuffing wheels, is maneuverable, and comes with a variety of attachments for many types of surfaces. If your home consists of mainly low piled rugs and smooth flooring, and you like the design of a canister vacuum then the Olympus is one of our top rated choices. However, if you have any medium to high piled carpets then you should look elsewhere. Something like the Miele Complete, or even a full sized upright would work much better. If you are ready to check pricing and read more about it, click here to visit our favorite ecommerce store. You can have it shipped right to your door in a matter of days.